The front cover of issue 11 features artwork by Ashok R. Patel from Gent University. With his colleagues, Ashok’s paper demonstrates a novel way of using food polysaccharides to structure liquid oil into oleogels and further explore its potential application as a shortening alternative. Issue 11 is also a part-themed issue containing selected contributions from the Food Structures, Digestion and Health Conference, held in Melbourne in October 2013. Click here to view the collection, Guest Edited by Professors Mike Gidley and Li Day. Keep up-to-date with the latest content in Food & Function by registering for our free table of contents alerts. 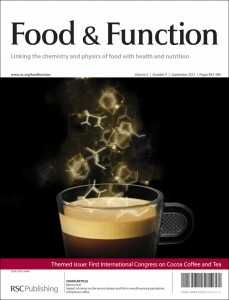 Food & Function issue 9 is a themed issue on Cocoa Coffee and Tea. It contains selected contributions from The First International Congress on Cocoa Coffee and Tea 2011 (CoCoTea2011). The Guest Editors Vincenzo Fogliano and Marco Arlorio introduce the themed issue in their Editorial which you can read here. Read the full themed issue on CoCoa Coffee and Tea here. 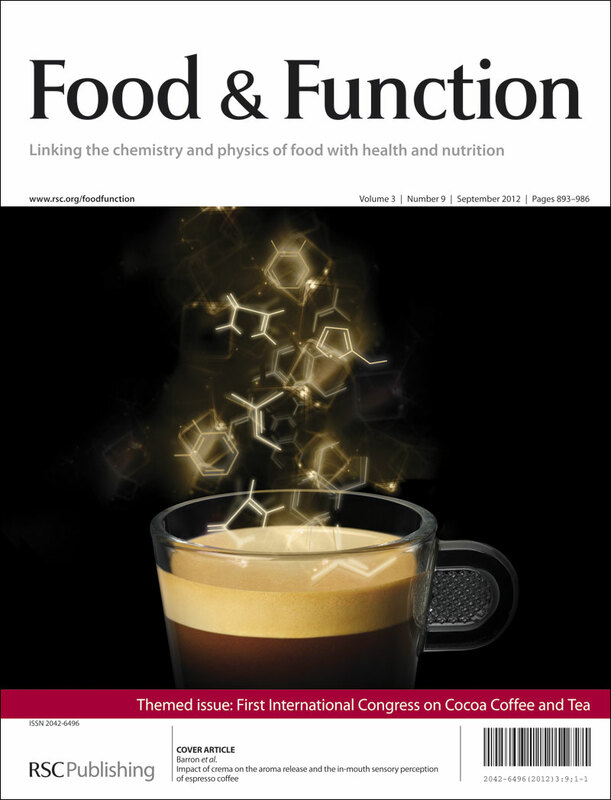 The front cover features a paper from Denis Barron and co-workers at Nestlé Research Center and Nestlé Nespresso in Lausanne, Switzerland. In their paper a series of six espresso coffees with different foam characteristics was produced by varying two preparation parameters, the extraction pressure and the filtration of the coffee beverage. The coffees were comparatively evaluated by a set of analytical and sensory techniques. The influence of the crema properties on aroma release are very complex, however, overall the presence of crema favoured the release of pleasant high volatiles. For more information read the full article here free for 6 weeks. Delivery of Functionality in Complex Food Systems – Themed Issue now live! 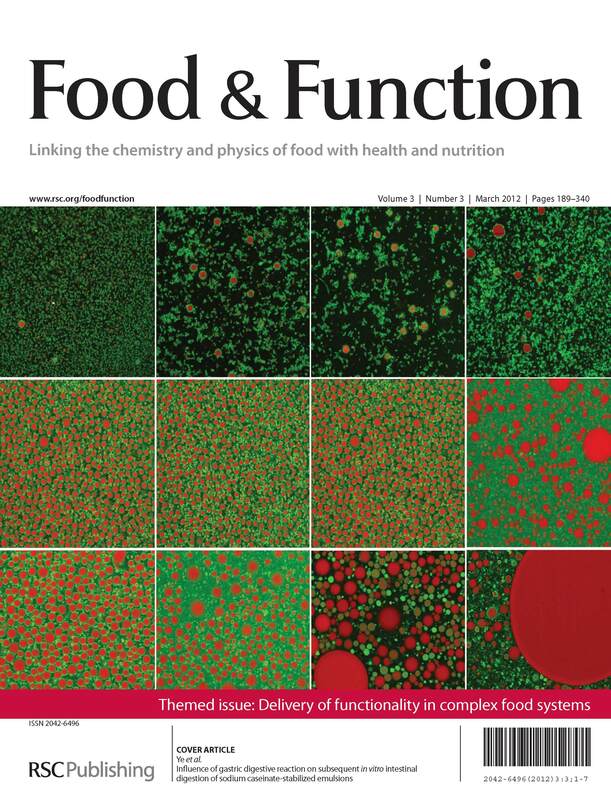 Food & Function Issue 3 is now online and is a themed issue on research presented at the Delivery of Functionality in Complex Food Systems Symposium which was held in Guelph, Canada, in August 2011. Read the full issue online here. This themed issue has been Guest Edited by Alejandro Marangoni, a member of the Food & Function Editorial Board. He introduces the topic, the conference and the themed issue in his Editorial which you can read here. The front cover features work from Aiqian Ye and co-workers at Massey University in New Zealand. Their study looks at microstructural changes of sodium caseinate-stabilized emulsions during in vitro intestinal digestion after digestion in a simulated gastric fluid containing pepsin for different times. You can read the full article here, it is free until April 12th. 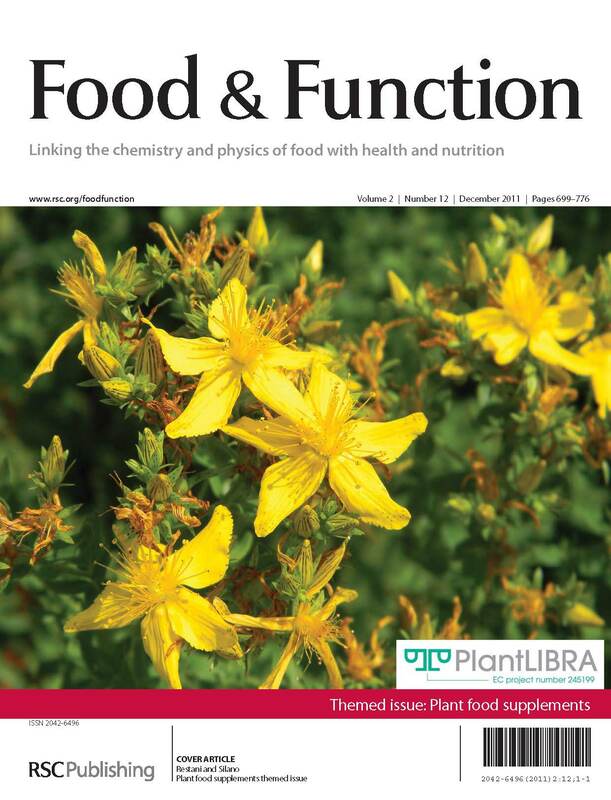 Food & Function Issue 12 is dedicated to a detailed analysis of regulatory, scientific and technical issues concerning safety, quality and efficacy of plant food supplements (PFS). Guest Editors Patrizia Restani and Vittorio Silano introduce the themed issue in their editorial which you can read here. 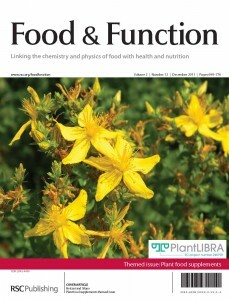 Read the full issue on Plant Food Supplements online here. The 4th International Conference on Delivery of Functionality in Complex Food Systems was held this week in Guelph, Canada and I was there representing Food & Function. The conference was hosted and organised by the University of Guelph with the theme of ‘Physically-Inspired Approaches from the Nanoscale to the Microscale’. The aim of this international symposium, now in its fourth year, is to focus on both basic science and functionality in food. As such, the spotlight was firmly set on the delivery of functionality by exploring and manipulating the fundamental physical and chemical aspects of food. 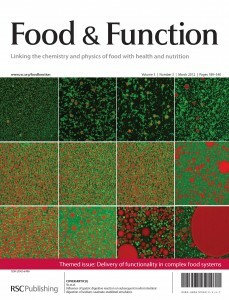 This focus makes Food & Function a perfect partner and we are proud to be publishing a themed issue of research presented at the conference, due for publication in early 2012. Over three days world renowned speakers presented on ‘Engineering Self-Assembly in Food Systems Principles and Applications’, ‘Novel Structures for Engineered Bioactive Delivery’ and ‘Food Structuring as a Means to Modulate the Physiological Response of Foods’. The oral sessions were complemented by a poster session with over 40 contributions. Food & Function board members Job Ubbink, Julian McClements and Erik van der Linden were amongst the invited speakers and Alejandro Marangoni was chair of the organising committee.